So, yes. I have crossed the line: I now own an e-reader. It was a birthday present from fishy, and a perfect one; I have been curious and attracted for a while now, perhaps not enough to buy one myself but more than enough to make it an excellent gift. It is a Kobo Touch, black and smooth and not at all shiny. It makes me feel like Jean-Luc Picard, sitting at my desk, drinking my tea, and reading documents on a little black pad. So what did I download? Here is the challenge: I have three books on hold now, three things I have wanted to read -- but a lot (read: the vast, vast majority) of the stuff I'm interested in and most of the stuff I'm not interested in was already checked out. I think our download system may be a victim of its own popularity. So I kept browsing until I saw something that tweaked a memory... 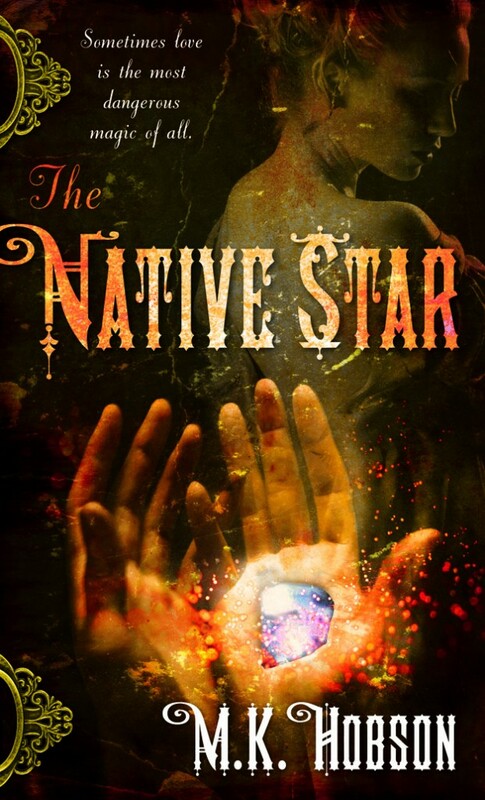 The Native Star was nominated for a Nebula some time ago, I believe, and something lead me to believe it was an alternate history fantasy with a strong romance component. Just the sort of thing I might quite enjoy as an e-read. The experience of reading on the e-reader itself is going to take some getting used to; I still have the same problems I mentioned before, though certainly not as pronounced and very easy to overcome on a dedicated e-reader versus my laptop. I miss the ability to flip back and forth through the book quickly and easily, is the big thing, and the dimensionality of a paper book. And the attractiveness of it. Kobo has its own kind of attraction, but it is not the same sort of attraction that a beautiful hardcover or trade paperback might have. Overall, though, so far I am growing rapidly quite fond of the thing; I may even resort to giving it a name. The idea of having multiple books at my fingertips for travelling and sitting in waiting rooms (a favourite occupation lately) without giving myself back problems from carrying the weight is really extremely attractive. Technology aside, let us move on to the meat of the thing. I'd blame the fact that I was up too late reading this, couldn't sleep after stopping for the night for thinking about it, and woke up at an ungodly hour to finish the damn thing on the fact that I was reading it on my new toy, but... I think anyone who knows my reading habits would sniff out the lie immediately. It has nothing to do with technology and everything to do with my own inability to let an exciting plot be. And this is a very exciting plot. It's a travel story, an adventure story, a quest really: Emily Edwards, small-town frontier witch in California, comes into possession of a strange magical stone after a series of questionable choices. Very shortly she becomes the target of some of the most powerful men in magic, all of whom want the stone for their own aims and don't seem to care to much about what happens to Emily in the process. One disgraced warlock, the improbably-named Dreadnought Stanton, makes it his mission to get Emily to New York to the one person who may be able to help her. But the journey is perilous -- pursued by government agents, bounty hunters, and mysterious factions that Emily has never heard of, Emily and Dreadnought are in for a very dangerous, very challenging cross-country trip. One of the things that stood out for me from the beginning was how strangely unlikeable I found some of the characters, even the protagonists. Both Emily and Dreadnought (okay, that's it, I'm calling him Stanton from now on -- you will be glad to know that his name doesn't go without comment in the book, either) are prickly, unpleasant, and mulish to begin with; Stanton is insufferable, and Emily makes some really questionable decisions straight off the bat, and then continues to be stubborn and off-putting for chapters after. This is a brave choice, to have your protagonists be difficult right at the beginning of the book. But it works here, because gradually I found myself coming to enjoy and then really like both of them. Other characters have their own quirks; while many of them only show up briefly, they are all well-described. The villain, mind you, is thoroughly despicable and irredeemable, possibly to the extreme; I found nothing to recommend him, and he was a bit of a mouthpiece for a point Hobson wanted to make. I often like my villains with a bit of ambiguity, but it didn't take away from the story here -- the complexity of the other characters made up for it. I didn't find the writing to be spectacular; the phrase "workmanlike" occurs to me. It's not inspired, but it's also not boring or lacklustre. It's just there, and it serves its masters Plot and Character well enough. The only thing that occasionally bothered me was that Hobson can be a little unsubtle in her Messages. You know, the ones where we're looking at "racism is bad" or "rabid patriotism is bad" or "greed is bad" -- that sort of thing. There are parallels drawn with oil, natural gas, and other non-renewable resources that are pretty blatant. It got a little heavy-handed at times, but again, frankly, the plotting can carry it; or at least it can for me, because I generally agree with Hobson's views on these issues. The world-building, on the other hand, is excellent, and worthy of notice. I would love to find more alternate history fantasy set in the Wild West if it's done as well as Hobson has done here (Patricia C. Wrede's Thirteenth Child comes to mind, though they're completely different worlds; I have enjoyed the setting of both.) There are vague steampunky elements, but they're not terribly prevalent; really, I can only point to one section with a flying machine that I would think of as straight steampunk at all. The system of magic is interesting, if slightly predictable (can anyone recommend a good fantasy where blood magic is not automatically evil? I've seen a few where necromancy gets a fair shake, but nothing with blood) and well-integrated into society as a whole. There are even anti-magic factions, a religion that struck me as particularly recognizeable and realistic. These little details were nice touches as well as plot drivers. Overall, I think Hobson's attention to detail is what makes the book as good as it is, giving it a ring of gritty veracity. Her realistic characters and settings mean it's a much simpler task for the reader to suspend disbelief and enter the book wholesale. I would recommend this to fans of fantasy and alternate histories; I would also recommend to fans of romance, though be aware that the romance isn't a central point of the story, more of a pleasing sidenote, despite the book jacket copy. It would be a good jumping-off place for fans of paranormal romance to slide into an adventure-based fantasy, for example. There will be a sequel, I believe it's possibly already published, but the book stands on its own -- it's just the epilogue that sets up the next tale. So, Kindle is 'impossible' huh? I enjoy my K. just for bedtime reading because it is easier to hold and turn pages, but it is getting expensive. $4 here, $8 there and it mounts up. I've gotten some of the old, free books but they aren't always nicely formatted. As long as there are paper books in the world, they will be my favorites, but my little Kindle definitely is a big part of my reading these days. Will you get some baby books on your new device?? Re: baby books, I guess I could, couldn't I! I don't know how it would work for reading reference-type books -- hard to flip through, really, which is what I want when it comes to ref books.